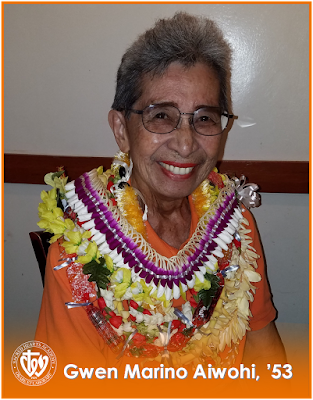 Today, the Sacred Hearts Academy faculty, staff, alumnae, family and friends mourn the loss of Gwen Marino Aiwohi, '53, who peacefully went home to God on the evening of Saturday, January 13th. She was 82 years old and was a familiar face on the Sacred Hearts Academy campus for many years having worked in the Admissions office alongside Karen Muramoto, Admissions Director. The family requests that you bring a favorite photo or memory of Gwen to share at her service.